I am struggling with program crashes when using a 64bit executable with editable list views. I have tracked down the Problem to the SRC-Compiler in conjunction with a user supplied manifest. I get a program crash as soon as I leave a cell from the listview (etc. by pressing the tab-key). I am not clear as to whether a manifest makes any difference under 64 bits. If it does then the manifest takes a different form. See for example, ftn95.chm under "x64 platform" and "Introduction to 64 bit FTN95". Oddly, the manifest referred to mentions 'Win32'. I would like to use the manifest, since without this I get an old Win95 style for buttons and other controls. I use exactly the example from ftn95.chm "Introduction to 64 bit FTN95". If I try to change attribute values (like "ia64" for processorArchitecture) according to the Microsoft documentation (https://docs.microsoft.com/de-de/windows/desktop/SbsCs/assembly-manifests) the program does'nt start at all with different error Messages. @Eddie : win32 is the only possible value for the type attribute according to the Microsoft pages. That's interesting. I never understood manifests, as they are described in a language that I don't speak - even though it purports to be English! A good number of years ago, I discovered somewhere the default.manifest, and I have used it as a mantra to ward off evil Win95 demons and give me a later look and feel without the bad vibes- but then I only have need for the 32-bit version. My (limited) understanding of such things suggests that ia64 is a bad choice, as I think FTN95/64 uses the other (x64) option. "*" appears to work for both "X86" and "x64". It worked OK for me. I will check it again tomorrow. If you run SRC externally then you need /r on the command line. Then load the .res file when linking with SLINK64. clrwin.manifest is the same as posted on Monday. Starting the program, editing the cell with contents "Test" and exiting the cell by pressing the tab-key produces the crash with the error message posted above. When I compile and link the same source as 32bit, the program runs fine. I have managed to generate an error condition. I did not activate the cell as you now describe. I will make a note that it needs investigating. The failure occurs within the Windows API so it might be difficult to fix. I now have a potential fix for this failure. It is a fix that needs verifying in that it could do more than fix the failure by perhaps stopping other legitimate activity. 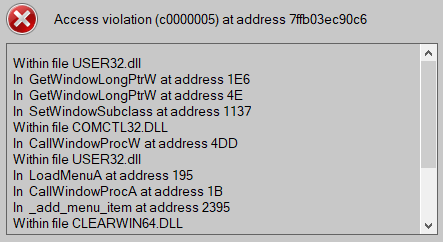 Here is a link to a clearwin64.dll specifically for this issue with the potential fix applied.